The most striking thing about the Snap IPO is clearly the valuation. Snap doesn’t have any earnings, but it does have a modicum of sales. After two days of trading Snap is fetching a price to sales multiple of a whopping 78x. 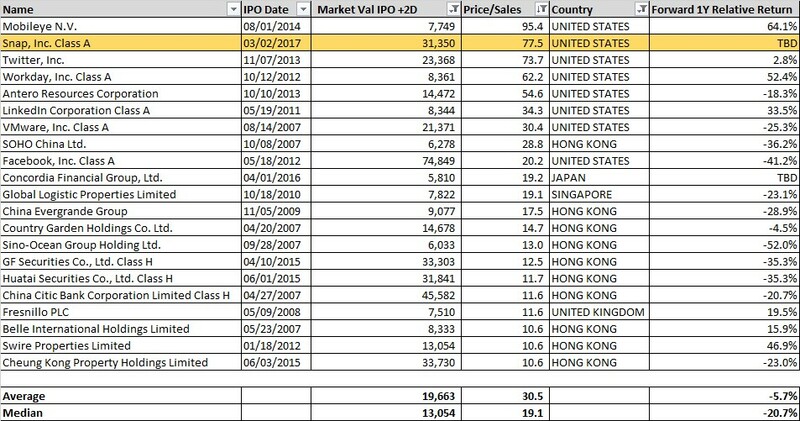 How does that multiple compare to previous large IPOs and does that multiple tell us anything about future relative returns? So while the odds that Snap puts up a good year following a strong first two days aren’t great, that possibility cannot be ruled out. Indeed, Twitter and LinkedIn managed to do just that even as Facebook stumbled. What’s more, there isn’t a great relationship between valuation and forward returns for these young companies. Snap Inc (NYSE:SNAP) closed at $27.09 on Friday, up $2.61 (+10.66%).